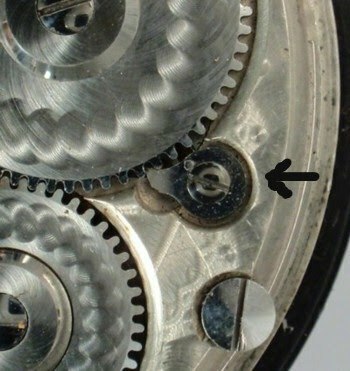 The winding of the mainspring requires a click spring on the winding wheel. The original click on the Model 92 is a solid piece whose spring is underneath the barrel bridge and is used through serial number run 16110601-16111000. 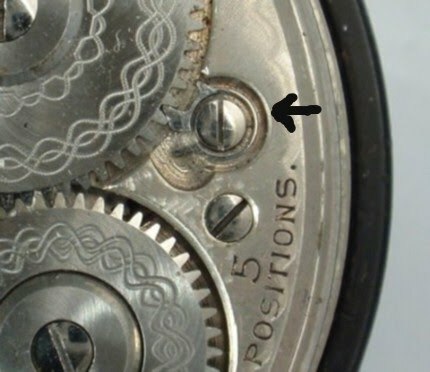 At serial number run 16111201-16112000 Waltham uses a split click, the spring of which is part of the ratchet itself and is visible from the top of the movement. This change corresponds to the 08 Regulator variation. It is not known at this time if the previous run, 16111001-16111200, a run of 845 hunters, uses the solid or the split click. At least one movement from run 16112001-16112500 (which follows the 16110601 run) has the solid click. This is a run of P.S. Bartlett movements. The next run, 16112501-16113500, is a run of PSB open face movements. It would appear that these movements use the split and that it is used to the end of Model 92 production. The current research would suggest that this change is pretty abrupt and that there is not much of a transitional phase.